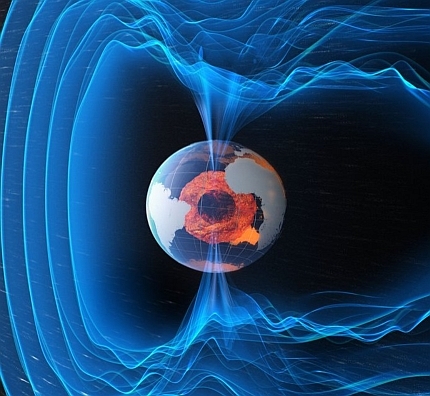 The popular press has been fretting about the impending demise of our protective magnetic field. Rightly so. We can expect all sorts of nasties when the field fails. The European Space Agency recently placed a “swarm” of magnetism-sensing satellites in orbit. Well, three in-tandem satellites is hardly a swarm, but the project is called SWARM and its mission is lofty. Since November 2013, this new enterprise has been measuring the magnetic field generated by the Earth with a degree of sensitivity never available before. At a June 2014 conference, scientists intimate with the new data showed that the magnetic field has weakened over the Western Hemisphere during the course of their six-month observation. This, of course, confirms other studies and other data sets. In The Mountain Mystery, I wrote a bit about the history of the discovery of the magnetic field – and the discoveries of its various perturbations. Sir William Gilbert used inductive reasoning to realize that the Earth has a heart of iron which generates the field. He thus corrected the idea that the magnetic field which guided mariner’s compasses was not generated by the North Pole or some undiscovered magnetic island in the Arctic, as most believed at the time. Another Englishman, Robert Norman, discovered the compass needle’s dip while still others saw that the magnetic pole drifted with time. It was not until the early twentieth century that magnetic reversals were found in rocks – something that baffled geologists were decades. Another interesting insight was proposed by a husband and wife team of palaeomagnetoarchaeologists – or whatever we should call people who examine the remnant magnetism in old clay pots and prehistoric clay-lined ovens. In the 1930s, Emile and Odette Thellier studied over 200 old kiln sites in their native France and concluded that the Earth’s magnetic field was at a maximum just 1,150 years ago. Later, they sampled outcrops and surmised that the magnetic field had disappeared entirely as recently as 41,000 years ago, then returned with the same polarity as it has today. Recently, scientists discovered that the mini-failure was actually accompanied by a very, very brief (250-year) reversal of the pole. It righted itself and came back with the same polarity it had before the collapse. If their science is right, this is important for two reasons. It tells us that the magnetic field can change intensity in rather short order. It also tells us that it can weaken to almost nothing, even briefly reverse, then return with the same orientation. The latter finding is quite significant. Rather than million-year stretches between total shutdown (assumed to coincide with reversals), the magnetic field may actually switch off (and return with the same polarity) somewhat frequently. This would mean that the planet’s creatures have survived many more periods of unprotected exposure to solar flares, cosmic radiation, and UV blasts than we normally tend to consider. I’d like to think that since humans survived other episodes, we will survive the next. Unfortunately, though, our electronics may be fried by the exposure – and today we are more dependent on electronic gadgets than the folks were back in 38,986 BCE. Read the book, The Mountain Mystery. This entry was posted in History, Space, The Book and tagged history, magnetism, mountain mystery book. Bookmark the permalink.